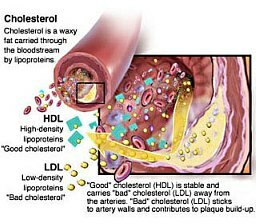 Natural Cholesterol Lowering: Can you avoid statins? 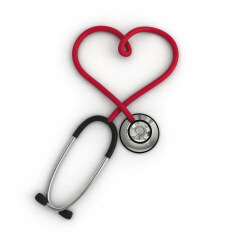 The number of people looking for natural cholesterol lowering is staggering. Why? Well, according to the latest medical guidelines, up to 42% of the adult population has high cholesterol levels, putting them at risk of heart disease. The "safe" level of cholesterol keeps getting lowered all the time, which means even more people have "high" cholesterol. The second most commonly prescribed drug is a "statin" (a type of cholesterol lowering medication). Once you need these medications, you're pretty much on them for life to keep your cholesterol where it's supposed to be. The problem is they're expensive and have side effects, so you want to be off them right? Your cholesterol level isn't that important. The first thing that happens is the inner lining of your blood vessel gets damaged. That can happen either by free radicals or having too much sugar in your blood (because you're diabetic or you just ate a high glycemic meal) . Now an LDL "bad" cholesterol molecule can get stuck in the vessel lining. Of course, your body has a built in repair system, so it sends out "repair cells" to stop the irritation. The oxidized cholesterol doesn't let the repair cells do their job properly and the lining becomes inflamed. The inflammation causes more cholesterol and repair cells to come to that spot, which causes more inflammation. The constant inflammation makes your vessel wall become thicker and the injured spot (now called a plaque) keeps getting bigger, so the opening keeps getting narrower. Eventually, the plaque ruptures and causes the whole blood vessel to become blocked, leading to a stroke or heart attack. What if you could stop step #3? You would stop the whole inflammatory response and it's the chronic inflammation that is the problem in heart disease. You know when you buy a picture frame and they put the price tag right on the front of the glass? You peel the price tag off and the whole thing comes off. Excellent- you're done, right? No. You touch the spot where the price tag was and now you can see dirt stuck to the sticky residue. So you take a paper towel to clean it off- now you have dirt and paper towel stuck to it. If you used something sticky to try and peel that off, you would just keep adding to it, and you'd have a larger lump of goo and dirt and paper, right? Well, think of the glass as the inside of your blood vessel. The price tag is the damage. The sticky residue is the cholesterol- not a problem until dirt (oxidation) sticks to it. Since antioxidants are natural anti-inflammatories, they are perfect for people wanting natural cholesterol lowering. They won't lower your cholesterol, but they'll prevent it from becoming oxidized. Supplementing with omega-3 fatty acids is a good idea as well. There was a study done a few years ago- a huge, well-designed, controlled study that you can trust the results from. People were given either a statin (the cholesterol-lowering drugs everybody's taking) or omega-3's. Cardiovascular disease was lowered by 21% and death by 16% in the statin group , but cardiovascular disease was lowered by a whopping 32% and death by 23% in the omega-3 group. Amazing! Especially since taking omega-3's doesn't lower your cholesterol at all. They DO have an anti-inflammatory effect though. So what would you rather take? A statin with all it's risks and side effects or an omega-3 supplement with no side effects and actually works better (AND has lots of other benefits!) Hmmmm... don't have to ponder this one too long. The study is even more proof that statins may not work because of lowering cholesterol at all, but by decreasing inflammation (because they also have an anti-inflammatory effect on your blood vessels). Exercise. (I know- not what you were hoping for. But hey, if you're looking for a natural cure...) It's the only natural cholesterol lowering agent out there. Combined with a proper, healthy diet, it's the only thing that has been shown to significantly reduce LDL cholesterol (besides medications). Diet alone won't do it. So get exercising, because your doctor will still want to see those numbers lowered. You could also try drinking a psyllium fiber drink twice a day. Studies show only a slight decrease in cholesterol with this, but it might be just enough. Besides everybody needs more fiber in their diet for all the other benefits anyway! Just don't start at that dose all at once- you'll be VERY uncomfortable. And make sure you drink lots too. You can see that there's not a whole lot to be done for natural cholesterol lowering. I hope you've figured out by now that it's probably more important to prevent that cholesterol from getting oxidized. There is a regimen that we have had great success with for people who are interested in natural cholesterol lowering as an alternative to medications. Simply fill out this form and it will be immediately delivered to you via e-mail. Specific product recommendations that will give you these nutrients in the amounts you need. The same recommendations that we've had great success with our own clients for over 12 years. Don't worry! Your information will only be used to send you the report. I never spam or sell information.